Home Alexa Blogger SEO How To Guides PageRank Updates Seo Traffic Wordpress SEO How To Get Do-Follow High PageRank 8, PageRank 9 Backlinks? How To Get Do-Follow High PageRank 8, PageRank 9 Backlinks? We are nowadays is looking for backlinks that helps us to improve our search engine and Alexa rankings, alongwith Google Pagerank. But the question is 'How can we get those high PR do-follow backlinks?'. This is what we are going to discuss here now. There were many forums in the past that were providing High PR (like PR 8 or 9) Do-Follow backlinks. It has to be cleared that it is never easy to gain some backlinks with the PR 9 or PR 10. Hence, Google has reduced the PageRank of many forums that were doing it as a business by selling and providing backlinks to many blogs and websites. However, there are some tricks and techniques to gain do-follow backlinks of PR 6, PR 7, PR 8 and PR 9. If you are a Youtube Partner or knows someone who is a Youtube Partner, than it makes it easier for you to get a High PR 9 backlink from there by linking from a channel to your blog/website. Remember, High PR backlinks make a chance for you to increase your website's/blog's Google PR. It allows you to create your own account and provides an option for you to add links back to your blog or website. It is a High PR 9 website and getting a backlink from it is worth trying. It is quiet useful. As like Mozilla.com, it allows you to create an acccount and link your website/blog from it and it's Google PR is 9. But however, its backlink might not be a do-follow one, but it is great to give it a try. It could be very useful. 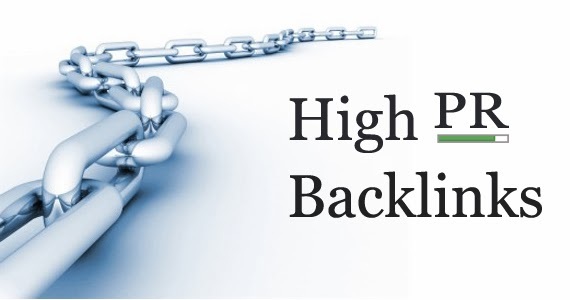 It looks easier to get do-follow High PR 8 backlinks in comparison with getting High PR 9 backlinks, but it could be difficult at times. Its a great idea to search for High PR 8 websites, making accounts/profiles there and linking from them to your websites/blogs. Almost 90% articles on Wikipedia seems to have Google PR 7. Wikipedia allows you to edit a article as after signing-up and you can edit their posts. If there are that are related to your stuff, you can add reference to it by linking back to your blog. Note: Be sure not to deface/spam Wikipedia's articles. We will try our best to collect more High PR blogs and provide you the list of them. Hopefully, these tricks are going to work for you as they are very much useful. Stay tuned for more SEO stuff! How To Maximize Adsense Revenue From Your Blog/Website? good site thank you for providing..